We are proud to announce our latest technological advance in Computerized Posture Analysis and Computerized Spinal Exam (EMG). These non-invasive procedures can visually show you your posture compared to correct posture, and the state of your nervous system. Photos are taken of a patient using a digital camera with focus points (dots) placed on the person's clothing. The data is inserted into an advanced computer screening program that measures over 30 critical posture points on your body. The data is analyzed and a full screen printout is developed showing your posture analysis. Below is some technical data as well as actual photos from a screening at the bottom of the page. Please call Community Chiropractic Offices to schedule your posture screening and evaluate what additional hidden stresses may be affecting you. Dr. Jens can instruct you which exercises and corrective chiropractic measurements can be taken to relieve the stress on your body. This is one sure way to relieve those hidden things that may be affecting your overall health- without drugs or medicines...naturally! Normal, neutral posture has been well established, as illustrated in figure 1. By far, the most common posture profile presented in a chiropractor’s office is Forward Head Posture (FHP), carrying the head forward of the center of the shoulder. A clinical study isn’t needed to confirm this, simply look at your next 10 patients. An example of FHP is presented in figure 2. Object A reflects a normal, neutral lateral posture. Object B demonstrates the classic FHP profile, with the red line representing the amount of forward head travel. We can see if you have head forward posture, a commonly undiagnosed posture problem that can cause problems in the future, like early arthritis, headaches, neck and shoulder pain. After a careful analysis of your posture, we then decide which would be the best treatment option for your particular case. We can also keep track on your posture progress. 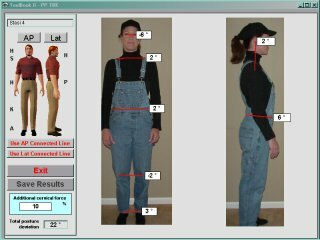 This is the computer screen which shows the photos taken for a posture screening. Non-invasive means no x-ray, keeping your clothes on, and standing for two photos. The computer and Dr. Jens do the rest. 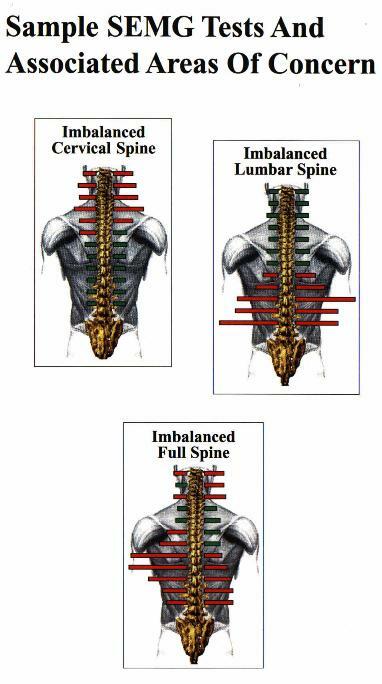 These show several points and variances in the person's posture. 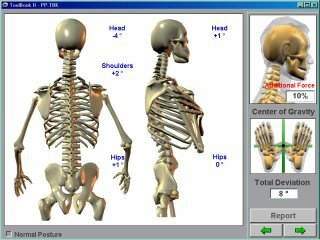 This screen view shows the degree of additional force on a person's neck from poor posture. Also shown is the person's center of body gravity which can result from many years of poor posture and habits. Whether it's too much time in front of a computer screen hunched forward, improper sitting while watching TV, or many other factors. Call Community Chiropractic now to book your personal posture screening. We can also show you the effects of time. How your posture will end up looking if you continue doing nothing about your problem. This is very advanced technology that can calculate your posture in the future, taken into account how your posture is now and the effects of gravity with age. Neck or Back Pain?...This 3 Minute Test Helps Find Out If Chiropractic Care Can Help You! There is NO-OBLIGATION. This Test Is Fast & Painless! SEMG stands for Surface Electromyography. SEMG is a device which measure the amount of electrical activity your muscles release when they are contracting, more commonly known as muscle tension. It is similar to an EKG, which measures heart muscle activity. Not at all. It is totally non-invasive and does not cause pain or irritation. This makes it totally safe for infants, children, pregnant women and seniors. It simply required the placement of small probes against the skin. The test takes less than a few minutes. Muscles have a tendency to "brace" in response to spinal misalignments, known as vertebral subluxations. These subluxations create nerve interference which effect muscles, blood vessels and internal organs. Studies in prestigious Chiropractic and Medical journals have shown that surface EMG (SEMG) to be very helpful in determining if your body is "tensing" in an abnormal manner. This can help verify the severity of your condition and help track your chiropractic progress. Vertebral subluxations reduce your body's ability to maintain optimal health. When Vertebral Subluxations are present, the nervous system is negatively affected, resulting in increases or decreases in muscle activity. The SEMG shows the muscular component of the Vertebral Subluxations. My job is to detect and correct these Vertebral Subluxations by a simple and effective procedure called an "adjustment". Why Do I Use Computerized Spinal Examinations? As a modern Chiropractic Practitioner, I am committed to using the highest quality research and clinical grade medical instrumentation available for the purpose of detecting and correcting Vertebral Subluxations. Computerized Spinal Examination, specifically Surface Electromyography (SEMG), is used to evaluate the relative levels of electrical activity associated with Vertebral Subluxations. By interfering with the communication between the brain and the rest of the body, a Vertebral Subluxation produces improper electrical impulses, which can lead to poor health. This altered or abnormal (pathophysiologic) state is then recorded and displayed by Computerized SEMG. SEMG Scanning provides qualitative and quantitative data to assist me in determining which areas/levels of the nervous system are being adversely affected by Vertebral Subluxations.